Ward 28 appears to be the “Wild East”, in terms of disregard for the city’s tree bylaw by a few residents, and lack of bylaw enforcement by the city. The city’s Private Tree By-law is intended to preserve significant trees on private property in the City of Toronto, to assist in sustaining the urban forest in the City. Trees are good for the environment; they represent one of the best ways to remove CO2 from the air. The owner of 5 Wascana chopped down 4 trees on his property during the August long weekend. And 4 months later, only a block away, there is another chain saw and “cherry picker” in action: this time, at the rear of 508 Queen East. 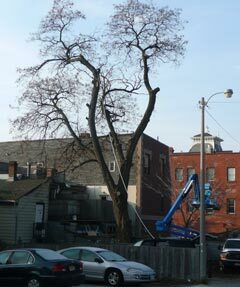 John runs “Pete’s Open Kitchen”; his son Sam cut down a 60 foot high, 100 years old, apparently very healthy tree this weekend (Nov 28-29). Toronto’s 311 service may be available to take complaints 7 / 24; our city politicians brag about lofty world goals of their Toronto Atmospheric Fund (“combat global climate change and improve air quality”), but apparently, even when alerted, city bylaw enforcement officers aren’t available to show up in time to save a local tree. Hey politicans: don’t bother making rules such as the Private Tree Bylaw, that you’re not willing to enforce! 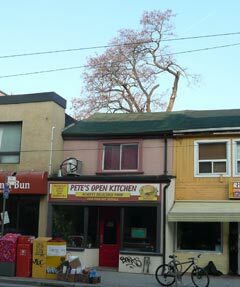 We urge local residents tell the owner of “Pete’s Open Kitchen” (508 Queen St E, Toronto, 416-363-0948) why you won’t be eating at his restaurant anymore.